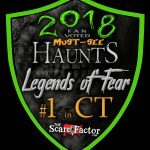 Legends of Fear is a Haunted Attraction located in Shelton, CT. 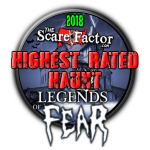 Team Hallowoosh reviewed this Haunted Attraction on October 6, 2018. 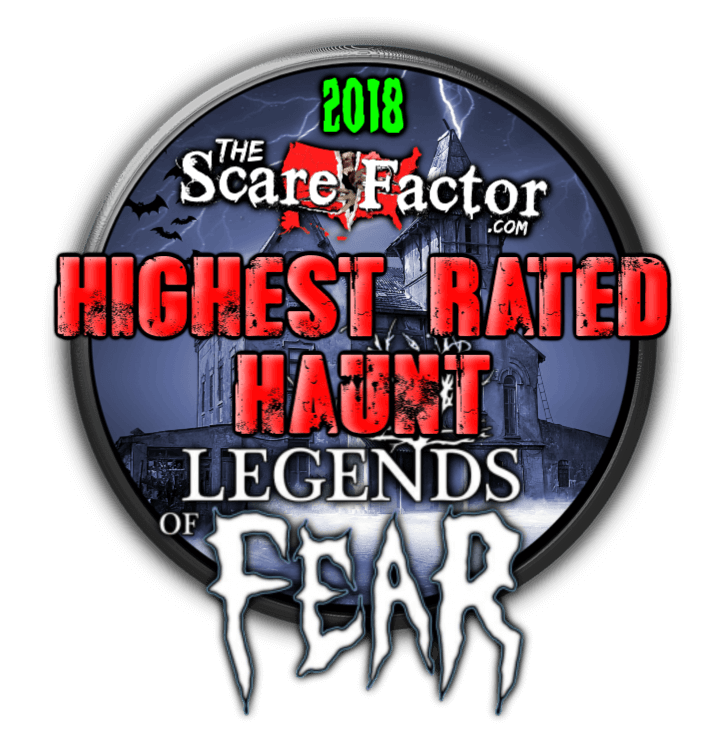 Ladies and Gentlemen, Boils and Ghouls, if you have been looking for a scary as Hell and fun-filled October evening in New England, then you have no further to look than Legends Of Fear. 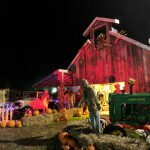 This Halloween destination can not only bring the toughest boys down to their knees, but they can also just as easily take even the Grinchiest of Halloween haters and turn them into the candy-loving, pumpkin-carving, leaf-peeping, cider-drinking humans we all know and love. I said it after the first year I attended and I’ll be saying it till the day I die: “Why the Hell did I wait so long to find this place! ?” A few years ago, we decided to stop by during the daytime when they offered a short, no-actors, no-effects wagon ride (for the kiddies). The impression we got from just looking at the sets in the daytime was enough for me to make it my first destination for the next season. Brad, the owner, let us take a stroll through the trail before we had to be on our way. The sets they had in those woods almost forced me to reconsider my plans for that night. Unfortunately, we had promises to keep and I wouldn’t be able to see the Legend that is Legends Of Fear for a whole year. 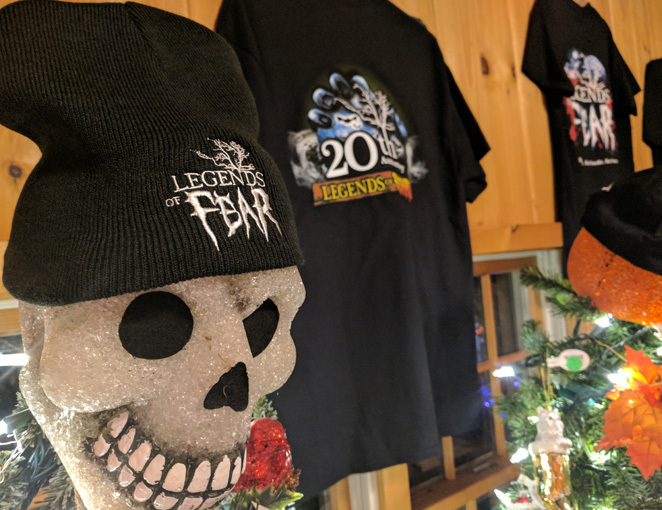 Legends Of Fear is celebrating their 22nd year in 2018. They are located at Fairview Tree Farm in beautiful Shelton, Connecticut, owned and operated by the very friendly, generous, and lovely Wells family and all of their dedicated and compassionate extended family and friends. 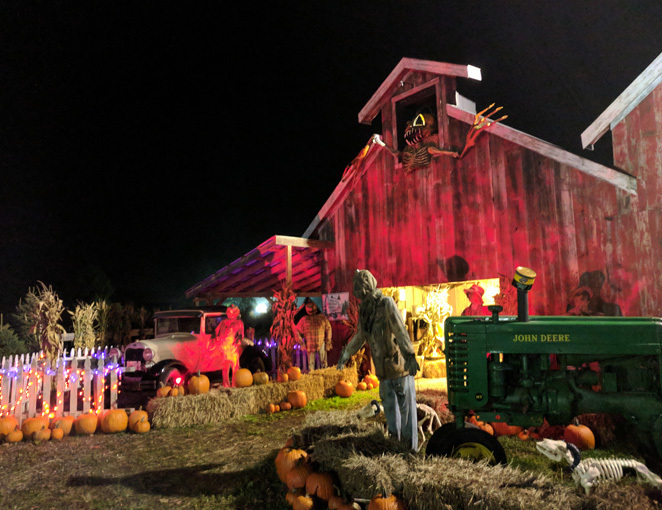 They offer a state of the art haunted hayride that takes their guests all throughout the tree farm and into the haunted forest at times and a haunted trail through the woods once inhabited by the infamous melon heads. On top of the two amazing attractions, they offer a full concession stand and the best merchandise store I’ve ever seen. We have seen many attractions over the years and, in most cases, it is easy to say any of them had too much of this and too little of that. 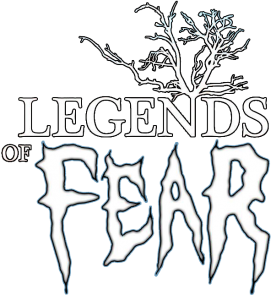 We try finding an imbalance at Legends of Fear and we keep coming up short. For the guests who want in-your-face horror, you will get your fill! For the guests who want the cool, creeping breeze of an autumn night in the dark, they have more than enough! This is a rare haunted attraction that can tickle the October bone of every victim that dares to enter. Where does one begin with this solid group of talented and amazing creeps? Right from the start, we knew that every single actor and actress in this glorious place was put right in the spots they were born to be in. They tell me that they have more or less 180 actors on their roster and I believe it because we lost count maybe a quarter of the way into the hayride. We found out that they have actors as young as five years old and as old as… well… older than most haunt actors I’ve seen. Part of the charm of Legends of Fear is this indescribable feeling of crossing paths with these actors and questioning if the acting actually starts when they take the makeup off. The haunted hayride presented quite a few different characters in their scenes. Much like most haunted hayrides we have gone to, there is always a large variety of evil creatures and menacing killers. 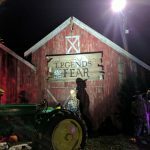 Unlike most hayrides we have experienced, Legends of Fear takes pride in developing some unique characters. I particularly enjoyed what I can only describe as a classical voodoo witch scene. After a long and convincing enchantment spell from two witches, multiple zombies emerged from beneath the stage and attacked the wagon. In true classic zombie fashion, these were not the flesh-eating walking dead types that we have grown up with. These were the zombies summoned by voodoo magic to do the bidding of their masters like zombies were in the good old days. We could tell the difference in their body language and the way they stared into our eyes. This was much more of a “we must strangle you” look than a “we want to eat you” look. We can’t get enough of a good hillbilly scene and Legends of Fear hit us with a big serving of hillbilly love to start off the night. I am not always a fan of characters yelling over each other, but when they start shouting things like “Y’all city folk look mighty tasty tonight,” and “Yer gonna meet all my brothers and sisters and cousins and aunts down there! They gonna like the smell of you,” it’s really hard to keep a dead face. Probably my favorite part of Legend’s hayride from the year before thankfully made a return. 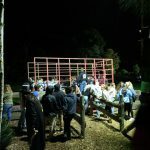 It has been a very rare occasion when a victim actor hides amongst the guests for protection, even more rare to find it on a hayride, and when a little girl jumps up on a hay wagon begging for help and running away from a family of meat clever-happy butchers, things get slightly more realistic for a few seconds. She kicked and screamed and cried in a way that I hope to only see at an attraction and nowhere else. There were about twelve fairly decent-sized scenes on the hayride. Each one of them contained at least a handful of dedicated actors. Each one of them looked and acted like they were made for their part. Even a crazy chainsaw girl made an appearance, which is something I do not see as often as I should! The Hallow haunted trail is divided into five sections. The Melon Head Revenge trail consists mostly of backwoods, dirty, cannibalistic beings. Not quite hillbilly rednecks and not quite branch and twig hut witches. Every actor and actress in this beginning section of the trail had two goals, convince us they were crazy lunatics and that they wanted to eat us. First one we bumped into took great interest in our eyeballs, which I thought was a weird place to start on the cannibal menu, but I liked it. After dodging an army of crazy people eaters, we made our way to the brand-new funhouse debuting this year. The actors in this crazy place were phenomenal! Three or four actors guided us into the new building, each one of them with their own unique carnie character. Inside we met a hilarious clown who spared no expense teasing our inability to escape the door room. I shamefully admit that he got me with a simple “boo,” which is the only time that will ever happen to this guy (maybe). The Hemlock Manor Mortuary brought a whole new breed of grim characters that I will never forget. After being introduced to the Manor, we were encouraged to take a self-guided tour through the mortuary. There were just too many casualties on the trail that night for the mortician to spare a moment with us, so away we went. For the first few minutes, the actors seemed to hold onto a feeling of grief and emptiness as if they had lost someone close to them. They made me drop my guard for the rest of the house which mainly consisted of insane lunatic doctors cutting away bits and pieces of their victims before trying to add us to their collection. Onto the Pine Hills Parish where I experienced some of the creepiest moments in my entire haunt traveling life. Thanks to the success of nuns finding a fresh breath of life in the horror community, we can now expect to see at least one at almost every haunt we go to. As abundant as they have been for me over the season, I was not prepared for a church full of them. The greatest thing about a nun character is the fact that they can just stare at you with their judgmental eyes and make you feel like something wicked is coming for you. I felt this from at least ten nuns that night. Also, the one actually playing the Hammond Organ didn’t help make it any less creepy for us. And finally, the Dark Harvest Trail finishes The Hallow haunted trail walk with a bang. We encountered demons, little children playing, camp counselors and campers being kidnapped by crazy woodsmen. I was thoroughly impressed with the camp counselors. Although we saw a wide variety of characters that night, after the nuns, we figured there was no way they could introduce another completely different type of scare actor. The camp counselors that pretend everything is perfectly normal when they tell you to just keep an eye out for missing campers really made the last part of the trail worthwhile. A character doesn’t always have to induce some sort of fear, these actors proved it can be just as important to set up a scare for later. We walked through a summer camp being told to have fun and play and watch out for any signs of missing campers who have all gone missing, you know… just normal stuff. Running into the campers later on and failing to protect them from the woodsmen set up their scene perfectly. The trail ended with chainsaw maniacs chasing us through their crazy carcass-filled saw mill. Not once did we see any actor or actress give up on trying to scare us or gross us out or just plain entertain us for a moment. This is what makes great haunt actors – never giving up and doing everything you can to get a reaction. Wonderful job well done by the crazies at Legends of Fear. One of the biggest complaints I have ever had with makeup and costuming at haunts is the fact that most of them follow a cookie-cutter style. 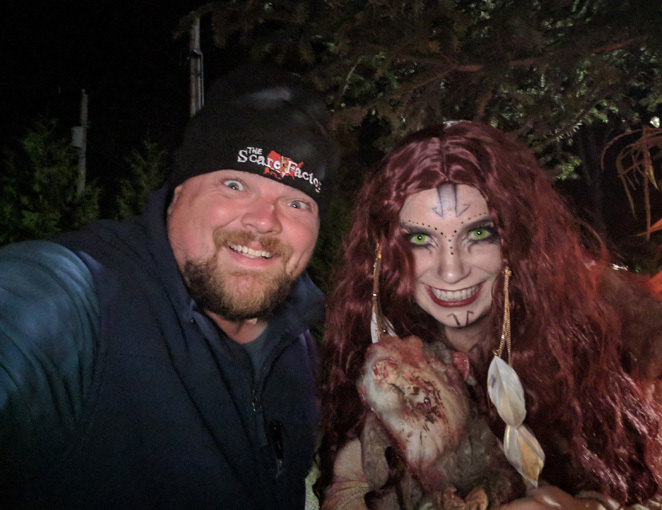 This is definitely not a problem at Legends of Fear. Other attractions might say all their zombies have to gray base their face with black airbrush while the vampires have to all wear a white base with a dark purple airbrush. The makeup artists at Legends know that every cast member has their own character with their own styles. With the exception of maybe the nuns, practically every character in the attraction could be identified by their different makeup and costumes, particularly all the witches on the hayride and in the trail. No two were the same and it really made their scenes pop. The same goes for every clown and carnie character in the new funhouse. You would think that once you’ve seen one clown you’ve seen them all. There is great attention to detail in both their makeup and costuming that puts many carnival-style attractions to shame. The majority of the actors had professional makeup jobs. The few that we spotted behind masks used them properly and they made sense for their scenes. We would find a roaring teddy bear-masked actor in the dollhouse or a werewolf mask in the dark harvest trail with other fur-inspired sets and props. The only time we felt a mask didn’t fit in with a scene was during the hayride when we were attacked by a gang of insane chainsaw psychopaths straight out of the Purge movies. Complete chaos was all around us with strobe lights and loud metal music and, suddenly, in the middle of the wagon was an actor wearing a corn cob mask. This made me question the scene for a little while before I came to the conclusion that it was actually pretty funny, and I enjoy a little bit of humor thrown into complete chaos. I guess sometimes all you can do is laugh. If you are not from the area, Fairview Tree Farm sits just far enough away from any major route to make it feel like you are in the middle of nowhere, which can be a good thing in this case. Right at the corner of Saw Mill City Road and Walnut Tree Hill Road. 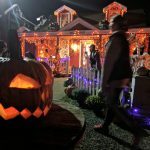 This area makes for a great authentic Halloween destination. They have plenty of parking space available. On some nights, if it gets a bit more on the busier side, they can open up an extra parking lot on the other side of the road so there is never a problem. Plenty of parking guides to help you find a spot. 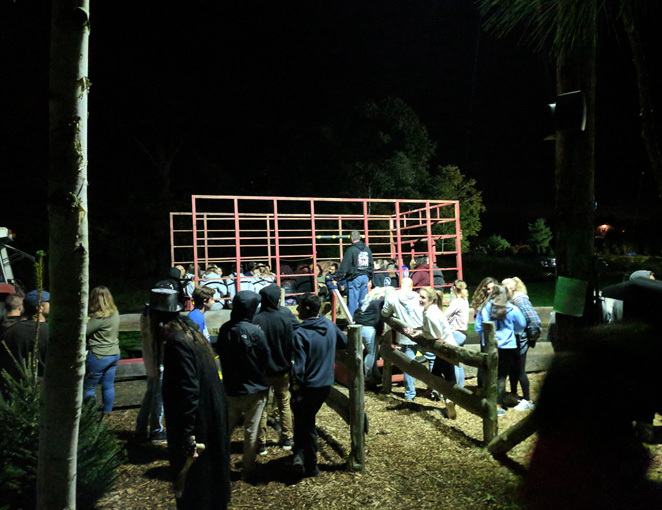 It might seem a little weird if you end up parking further into the lot than most others because the space is almost shared with the same path the hayride is on. If you run into this just trust your guides, they will get you to a spot. Portable restrooms are available near the parking area so you’ll know exactly where they are when you arrive. Both the trail and the hayride are somewhat designed to be comfortable and safe. We noticed that the trail is actually very wide and flat most of the way. It was rare for us to bump into a divet or a root sticking up. For almost forty minutes of walking it was nice to know that it would at least be easy walking. The wagons on the hayride didn’t force us to sit on the floor as most hayrides do. Instead, they have soft hay bales to sit on and what some might call a backrest since the wagons are caged up for hauling those bales. Wagon trail is just as smooth as the walking trail, no hills or dips or crazy turns. It was a safe and smooth ride the whole evening. 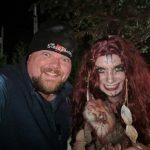 We talk a lot about what makes a haunted attraction a great one. Obviously, a great cast with amazing costumes and makeup and attention to detail all contribute greatly. Personally, I believe there are few things better in this world than the feeling of taking in the atmosphere around you on a cool October evening in New England. To be able to do this in the middle of a field or a dark forest while listening to screams and laughter and watching the distant light shows piercing through the trees is something magical. A lot of attractions don’t always have such luxuries, so I judge accordingly, but I will never ignore the beauty that Legends of Fear presents when it comes to their atmosphere. My absolute favorite part of the haunt is right when we entered The Hallow. We were given permission to enter the trail through a large wooded façade. We pushed back the burlap curtains and had to stand at the top of this hill just looking down into the forest. Fog was everywhere, but we could only see it when the lights flashed in the distance, casting creepy silhouettes of all the trees in-between. Small lights illuminated the wide trails down the hill and throughout the woods. At this point, up on the hill, we couldn’t make out what was happening, but we could feel what was happening, and that is something I cherish. 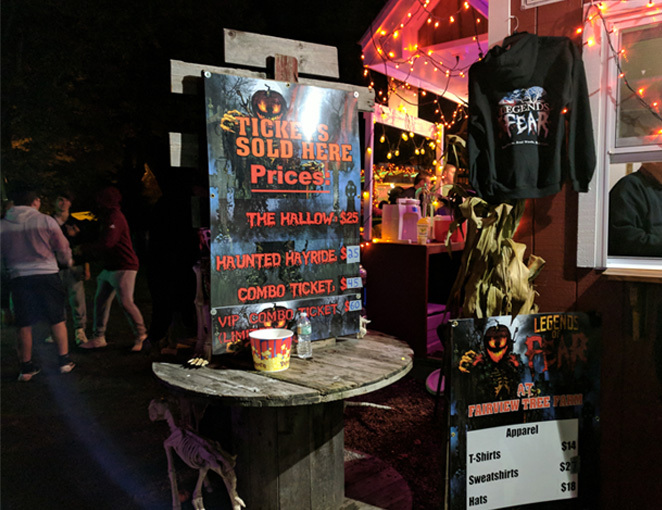 The main ticket and concession area are riddled with Halloween decorations, enough to make anyone passing by thinking this place must be Halloweenville, USA. It is impossible to not have a clue what you are in for right when you enter the parking lot. 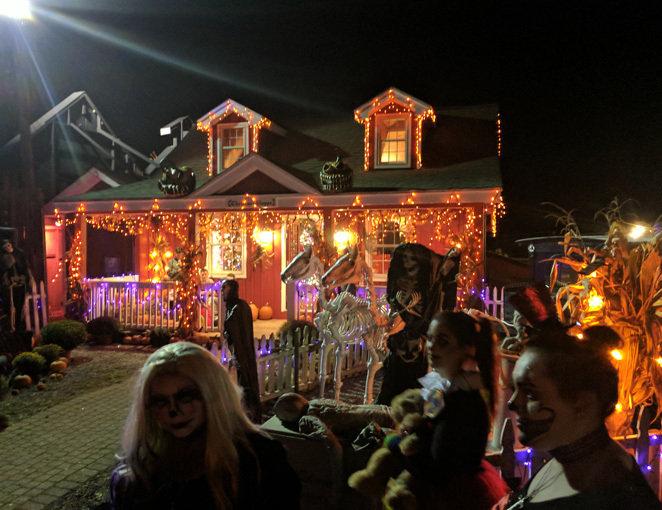 They had music playing all night, not always Halloween related, but it did give the impression that we were also there just to have a good time. There’s only so many times I can listen to “Werewolves of London” and still think it’s a party. They have TONS of photo opportunity areas; they were really hard to miss… even for people just driving by. 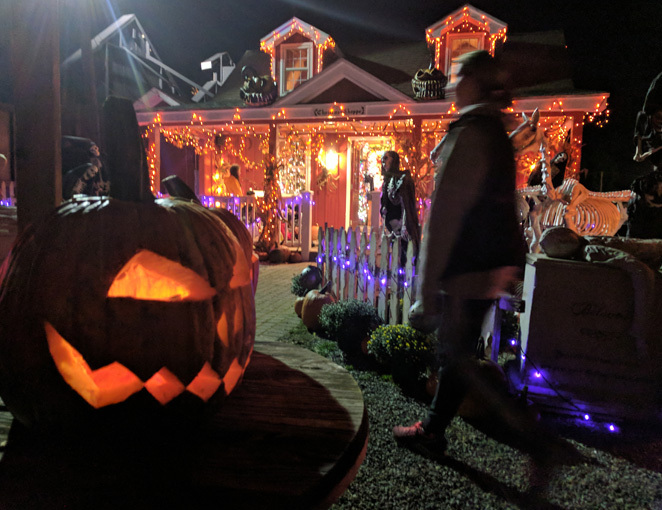 The entire area where we bought our tickets and food and merchandise is completely covered in beautiful Halloween decorations with skeletons, real carved Jack-O-Lanterns, Hay bales, Scare crows, even an amazing Ossuary (Ah-sue-ware-e). What’s an ossuary you ask? It’s an older and fancy word for a crypt, and now you learned something. The Wells family actually won this custom display at an auction in New Orleans after multiple haunt designers put their skills together to make it. It’s perfect for a spooky romantic photo op area. Also, I can’t forget about the goats (Brownie, Ernie, Misty, and Bonnie)! Right behind the gift shop, you can find these beautiful friendly goats for a super cute photo and show all your friends how much better your night was than theirs. Probably the ingenious thing about Legends of Fear is the fact that, when you enter and buy your ticket, you are soaking in an environment that screams “Halloween is Awesome!” Really what it’s doing is giving their guests a subliminal beacon of hope that this place might be toned down just enough for them to drop their guard a little… and then guess what happens. 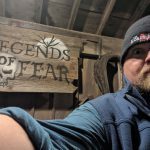 I said in the beginning how we’ve seen and heard about places that have too much or too little of any given aspect of a haunt, and how I believe Legends of Fear pulls off almost flawlessly a near-perfect mix of everything. Their special effects are utilized in such a great way that we were never expecting them and almost all of them worked exactly as how they were meant to work. 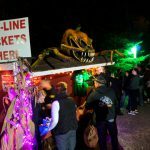 This year’s brand-new entrance to the hayride uses animatronics, state of the art speakers, explosions (and even a giant evil pig! ), and that’s all with the great actors that brought the scene to life. Further into the trail,during the voodoo witch scene, we rolled into a laser swamp. The laser swamp effect has been used like crazy all over the country for the last few years now and we have seen it used practically everywhere. So let me say this again, we were on a HAYRIDE and we went INTO a laser swamp. Where zombies popped up out of nowhere after being risen from the dead. Commonly seen in walk-through attractions, we have never seen anywhere incorporate these effects into a hayride. At one point in the Melon Head Revenge trail, were we attacked by a gang of zombies. We had seen this animatronic plenty of times before in other places, but this was set perfectly. It was directly in our faces before we even had a moment to question why there was a big hole in the wall, and the actors before this scare were keeping the quiet creepy level set at about an eight so we wouldn’t be expecting the flesh-hungry creatures’ loud attacks. Every effect is placed at just the right angle and set off to work at just the right time to get the best scare they can. It isn’t often that we see such focus to details like this in a haunted attraction. 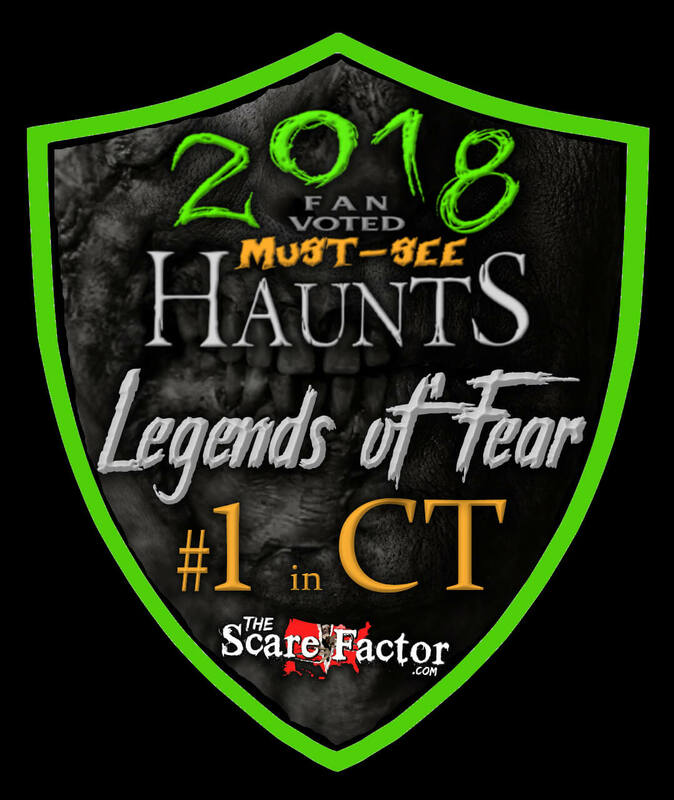 This is yet another amazing reason that makes Legends of Fear one of the top Halloween destinations in New England. The haunted hayride started off with a character introducing us to what would be the next thirty minutes of our night. 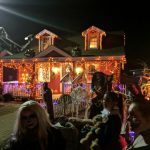 He states that, “The creatures of the night have awoken, and there is nothing stopping them.” I could say this sets up the theme of this incredible hayride. It is a field and forest full of the creatures of the night. The crazy hillbillies, the butchers, the witches, the nuns, and even the pumpkin gang all come out to play. The Hallow, as it is stated, is broken up into five sections all with their very own themes. There was a carnival-type section in 2017, but with the new Funhouse of Fear for 2018, I cannot recall anything that was the same from the year before. It is all completely brand new and follows the Funhouse theme to a T. They even have a mirror maze that we got a little lost in, just like the real thing! The Hemlock Manor Mortuary follows its own theme obviously as an overbooked evil funeral home. We found more real caskets in that building then I think an actual funeral home would stock. At one point, it almost felt like we had to make our way out of a maze of upright caskets before being attacked by the morticians. The Melon Head Revenge trail refers to a local legend that most visitors to the area wouldn’t know. Melon Heads are what the locals called a group of escaped mental hospital patients that took shelter in the woods near where Fair View Tree Farm is located. Using this folklore, they brought back the evil characters into this section of their trail now filled with dirty witches and lunatics all wanting to spare no piece of us. 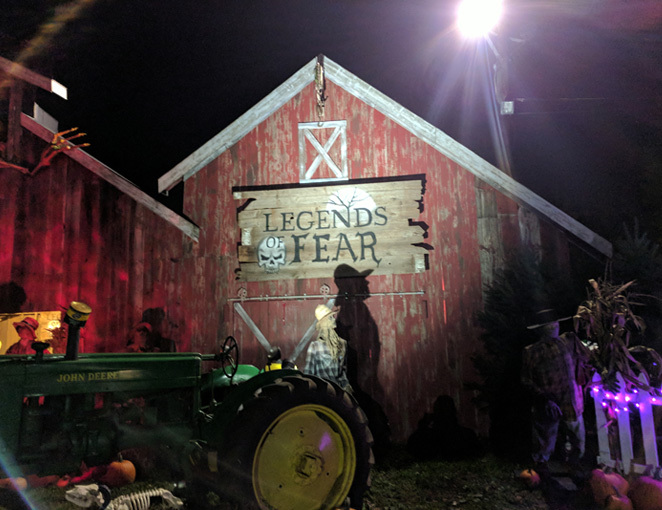 Legends of Fear does a fantastic job providing real frights to its guests, from letting them drop their guard just a little bit with their semi-PG-rated main area and then hitting them with explosions, and chainsaws, giant evil pig heads, and even a fire extinguisher! More than a few times, we felt trapped on their caged-in hayride where many creatures of the night entered and gave us little room to move away. The Hallow trail worked with sights and sounds gracefully, starting off just quiet enough with the Melon Heads and moving on to the loud and in-your-face trouble at the Funhouse. The Mortuary and creepy-as-all-Hell Parish are both just the right amount of quiet with a loud boom of intense horror to follow, then wrapping it all up with the Dark Harvest trail and their crazy chainsaw bad boys chasing us out of the sawmill. 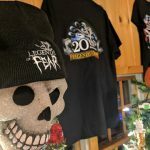 Scares are coordinated in such a beautifully artistic way at Legends of Fear that it is never too much or too little. We truly feel that in any case where we felt a scare wasn’t working was because the scare wasn’t over. Everything set up for the next scare like a glorious dance in the night. Tickets for the hayride and trail cost $45. You can opt to get a ticket for one or the other for just $25. Currently, with the exception of the Sunday before Columbus Day, the hayride only operates on Fridays and Saturdays. The hayride lasts about thirty minutes and the trail took us close to forty minutes. An hour and ten minutes in total spent only within the actual attractions themselves for $45 gives us a Minute Per Dollar rating of 1.56. This means for every dollar you spend you are getting a good minute and a half of entertainment, which is actually really good. This is just without considering all the creepy wonderful ghouls lurking around outside the haunts before you even pay to get in. Or the fire dancer shows or all the cool display areas or THE GOATS! Waiting in line for the hayride, we were treated to the spectacular fire dancing of Lady Blaze of LBSpinnerz ArtZ. It’s never a dull night when you can say you watched some people swallow, juggle, hula hoop, spin, and spit fire! She was having a blast, but only wished she could perform her fire roller-skating routine for the crowd that night. I can only imagine how cool that must look. The concession stand has plenty of warm options to choose from including hot dogs, hot pretzels, fresh popcorn and, my favorite, the hot fresh mini doughnut holes in cinnamon sugar. Get a baggie of those bad boys before getting in line for the hayride, and again for the line to the trail. 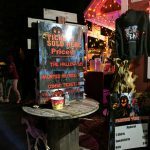 Candy and hot cider and even Bill’s world famous Lemonade make this one of the best concession stands I have ever seen at a haunted attraction. Their gift shop is completely loaded with T-shirts and hoodies and beanies. Don’t let the Christmas decor scare you, this place is also a very respectable Christmas destination for a lot of families, so they have to leave up at least some of that junk. 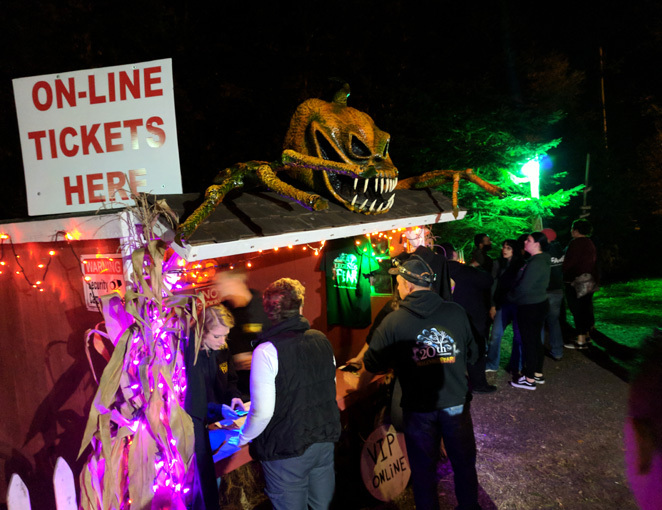 The line going into The Hallow haunted trail begins right where we pulled into park and it weaves in and out of the thick forest before the official beginning of the attraction. There were a few spots towards the end of the line where big projection screens played clips from some of our favorite horror films along with a few promo clips from Legends of Fear. 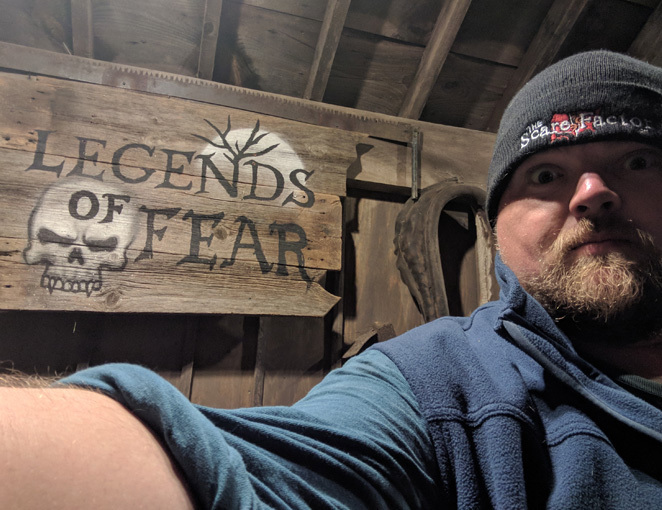 Legends of Fear is 100% one of the best places you can experience in October with a great value that is very hard to beat. They have made a repeat customer out of me and I can’t thank them enough for creating this spectacular Halloween tradition for all of us. Had the most fun being scared ever!!! Intricate details at each haunt, fantastic costumes, makeup …show more and actors!! Like they review title says place to go this year you have an option of a haunted hayride or haunted …show more trail. Legends of fear is a known place it’s based on a true historical story. Look up melon heads on Damned Connecticut to read about them.